Baking is one of my favorite past times. Even when everything else in my life is in chaos, baking is my outlet. I have talked before about how I deal with my stress by going into the kitchen and baking or cooking something for my family. It seems the older that I get the more that this trait seems to be appearing. My kids are both at stages where they fight all the time. Literally today it really did seem that the entire day they were fighting. I would love to say that I am one of those perfect mothers that never seems to be phased by their children's behavior. I'm not. When my kids get into these moods, I deal with the situation, give time-outs etc. and then turn to the kitchen and I bake. My kids have even begun to realize how mad I am based on the type of thing that I'm baking. Cookies means that I will only be angry for a little while. However, if mommy starts making a complicated pie or new recipe than they had better let me breath for a while. The hardest thing since going gluten free has been to re-adjust all my baking to no longer using wheat flour as a base. I have had a number of misses, but slowly I have become more confident in my gluten free baking skills. Recently, I tried a new recipe for Confetti Cornbread from All You magazine, which looked like a perfect baking recipe to make gluten free. This recipe has 12 ingredients. It takes 35 minutes of baking, 25 minutes of prep and makes 24 pieces. I had no problems finding any of the ingredients at my local grocery store. Obviously since I made this recipe gluten free I made some significant changes. First instead of using all-purpose wheat flour I used a combination of brown rice and sorghum flours. I am happy to report that my local super store now has a large selection of gluten free flours and I am very thankful that even in my city I am able to find everything without having to pay a ton. I decided to keep part of the seeds from the jalapeno and add them to the cornbread. The extra bit of spice helped to enhance the flavor. In order to prevent my cornbread from burning I tented the pan the last 10 minutes of cooking. I followed the remainder of the recipe as written. I have tried a lot of gluten free recipes in the last couple of months. Some have turned out spectacular. Other recipes have had to literally be thrown in the trash. This recipe modified well to being gluten free. Since there was fat from the butter and 3 eggs the cornbread didn't end up dry. I would recommend adding a small amount of milk to the batter if it is too dry due to the gluten free flour. A lot of recipes require additional liquid when being converted to gluten free. 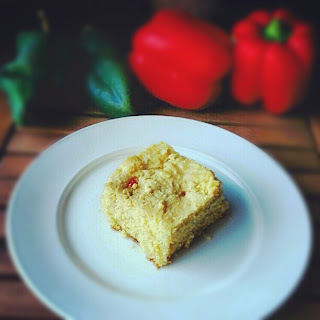 For the recipe go to Gluten Free Confetti Cornbread. Going over to check out your blog now :) Stop by and find a new recipe to try soon!